Governments on all levels use GIS (Geographic Information System) for storing and visualizing data relevant to their jurisdiction. These file types are also referred to as shape files. GIS data is traditionally stored on internal applications and is designed for sharing and displaying that information to employees. When the information is shared with the public, it is usually published as a PDF document, which has huge limitations. A large challenge for government, or business that use GIS data, is that most governments don’t have ways to efficiently share their GIS data. One of our missions at Cross Section Technologies is to make GIS data easily accessible to the public, even very large GIS datasets. 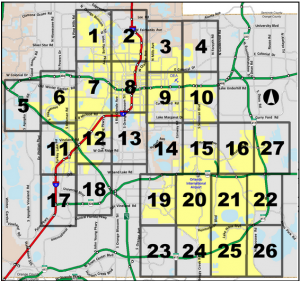 The City of Orlando publishes its zoning maps into PDFs and puts them online for download. This single GIS data set must be divided into 26 PDF documents to be put online. 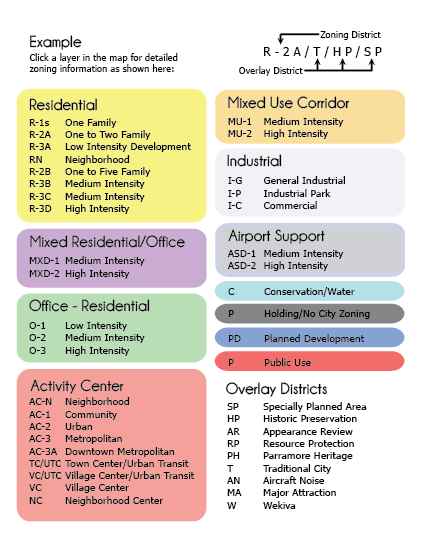 See their zoning maps. The overview of the 26 maps looks just like the image to the right. By clicking a number, you open the corresponding PDF. By publishing GIS data with the Google Maps API, the large GIS data set can be displayed in one instance. This format provides numerous benefits. This dataset is for demonstration purposes only and is not kept up to date with the City of Orlando.